During the winter months, the Kielder ospreys have been enjoying the warmer climates in Africa. Recently the Ospreys' trackers had dictated a flight pattern suggesting they were heading back to Kielder ready for Spring and Summer. On Wednesday 4 April, the live feed nest cameras, at Kielder Castle showed White EB the first of the birds to return this year, happily perched on one of the nests. Even though the weather in Kielder is set to be full of rain and high winds this week, it is expected that the other Kielder ospreys will return in the next few days. If you would like to find out more about the ospreys and see them in their natural habitat book on to an Osprey and wildlife motorboat cruise or head to Kielder Castle to see the live feed. 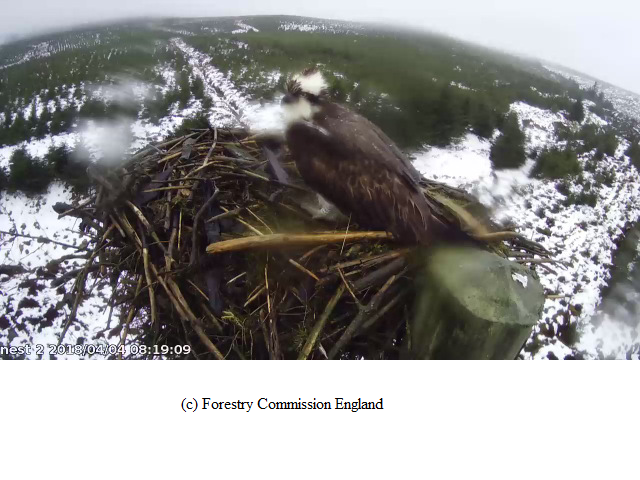 Further to the first arrival on White EB at the start of April, during the course of the week, more ospreys returned to their nests and got reacquainted with Kielder Forest. The Kielder Osprey blog has been keeping a full track on all the ospreys and which nests they have been visiting, to find out more you can visit their blog here.